Note: This feature is only available with approved call recording systems. Additional Go Integrator licenses are also required. If you use voice recording, you can automate the suspension of recording by telling Go Integrator which applications are associated with increased privacy. For example, let's say that you accept credit card payments over the phone and you use an online payment portal to do so while speaking directly to the customer. You need to suspend the recording while the details are exchanged. Simply adding the online payment portal to the list on this page allows Go Integrator to recognize when it is opened; it can then automatically suspend the recording in progress. Furthermore, it can also detect when the same app is closed and automatically resume the paused recording for you. For automatic suspension to occur, you must have ticked the Allow recording suspension tick box. Go Integrator can let you know when recording has been suspended and resumed using notification bubbles that pop up above the Go Integrator tray icon. To turn them on or off, tick or clear the Show messages tick box. 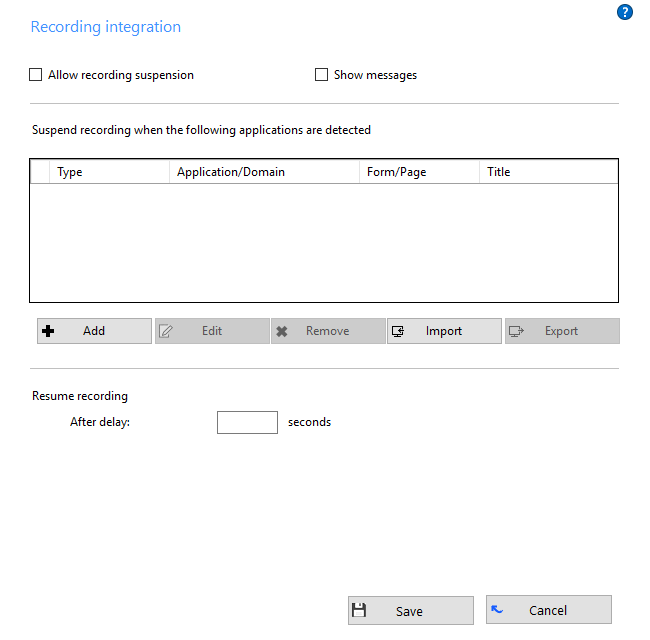 To add an application to the list, click the Add button to start the Recording wizard. The wizard will guide you through the process of identifying your app whether it is an online portal, a standalone commercial program or one you've developed in-house. You can edit existing apps' settings by selecting an app and clicking Edit. There are far too many possible values that could be encountered on the Edit screen that we can't cover them here so we would recommend NOT fiddling with them unless you know what they mean. To delete an app from the list, select it and click the 'Remove' button. This cannot be undone unless the app's settings have been saved previously. Saving your apps' settings is so quick and easy that there is no excuse not to. All you have to do is click Export and then select where to save the "recording.settings" file; we recommend keeping a copy locally on your PC as well as somewhere other than your PC (like a USB memory stick or by emailing it to yourself). This file contains the details for all of the applications and websites you have added to the list. In the event of a disaster or if you need to set up Go Integrator on another computer, you can click Import and then select your previously exported "recording.settings" file to load your saved details back into Go Integrator. Click Save to apply the loaded settings and you are back up and running again. If you enter a number into the After delay box, once a payment app or website has been closed, the recording will continue to be suspended for that number of seconds; leave blank for no additional delay. Full instructions on setting up voice recording can be found in the Voice Recording technical guide. † Some versions of Go Integrator either do not include or have modified implementations of this feature.